Sure, baby wipes are useful for diaper changes, but that's just the tip of the iceberg. These other 11 genius uses for baby wipes will convince you to keep some on hand at all times! Use a baby wipe to remove your eye makeup after a night out! If you have sensitive skin or just want to make the wipe a little more nourishing, add a drop or two of fractionated coconut oil to it before using. Keep baby wipes handy whenever you’re dyeing your own hair or someone else’s at home. They’re great for wiping up accidental smears or splatters of hair dye on your forehead or neck. You can also use them to tidy up smeared manis or pedis, or clean up self tanner accidents! Chilled baby wipes feel so refreshing on a really hot day. The next time you have a beach day, bring a bag of wipes along in your cooler. Then when you’re feeling sweaty, you can cool off with a refreshing chilled wipe! You can also keep baby wipes in your fridge during the summer to quickly cool off on those nights when you feel overheated. You can use baby wipes to make homemade hemorrhoid wipes that are so much cheaper than the ones you can buy in stores. Start with a package of wipes that contain aloe, then pour about 1/2 cup of witch hazel into the package. The combination of aloe and witch hazel is extremely soothing! Keep baby wipes in your car’s glovebox to clean up bird poop. Bird droppings can damage the paint job on your car, so it’s important to remove them as soon as possible. Keeping a few wipes on hand makes it quick and easy. Keep baby wipes on hand to clean up your dog’s paws after a trip to the dog park, or wipe your cat’s face clean after a messy meal. They are also useful for removing loose hairs from your dog or cat’s coat! Baby wipes contain moisturizing ingredients that can add shine to leather shoes, jackets, and purses. Just give them a quick wipe, then use a clean dry cloth to buff the leather to a nice shine. You can also use wipes to clean dirt off your sneakers and other shoes! When you have to seal several envelopes in a row, it doesn’t take long to get sick of licking the adhesive to moisten it. Spare your tongue and just use a baby wipe to moisten the adhesive strip instead! Use a wipe to clean chalk and dusty residue off of chalkboards. 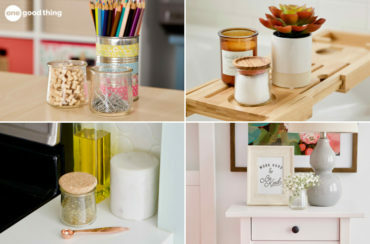 They also work for cleaning chalk off of surfaces painted with chalkboard paint! What’s your favorite way to use baby wipes? if you box of baby wipes have dried out, how do you refresh them? Getting dog nose prints off the inside of your car windows is a challenge. One day I grabbed a wipe in desperation and off they came. one great use is to cool off a hot steering wheel or to immediately cool of a hot baby car seat latch before putting baby in the car! live in southwest and everyone in my family uses it. I went to grab baby wipes for a recent trip to the snow and I found “water wipes!” GENIUS!! I love the idea that you have a complete clean pallet to make anything of them if you want, or to do nothing at all . I was excited to let my kids eat Cheetos in the car, for the first time EVER. I keep baby wipes in my bathrooms. I’ve been using them for years after using the toilet, I give myself a good wipe, but put them in the waste basket as most are not flushable. A cheap alternative to those cottenelle wipes for sure. I think I invented this concept back in the early eighties. I keep them in my camper year round too. Witch hazel for hemorrhoids are a life saver. Yes, baby wipes are much cheaper than those tucks wipes. I also add a splash to a wipe or toilet paper, but for some reason I never though just to add W.H. to the whole container. I guess bc I usually buy soft packs instead of boxes. I think I’ll try this! I buy the big box baby wipes from Costco. I think they’re kirkland brand. I also use them to remove makeup but sometimes I feel it’s too harsh for my eyes and it stings- not always but just sometimes – don’t know why. I also use them in the car for quick wipe downs. Another use is for my wood stairs! It’s so much faster to work from the top to the bottom with the wipes and a plastic bag. Gets all the dust bunnies! I always take a zip lock sandwich bag with baby wipes in my purse or bag for mishaps. After I check the oil in my car I use them to clean my hands; they work well on grease. I would do a quick wipe down on my car’s dash while waiting for someone. If they start to get dry just add a few drops of water. I use them to recondition my Cricut mats. You get all the small paper particles off and it gets “sticky” again. Saves from having to buy new ones so often. I use them in my fabric cutting mats as well.